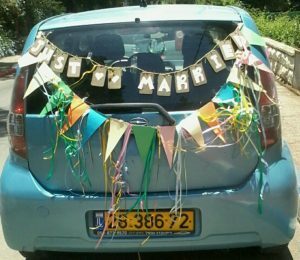 This morning, I found this “Just Married” car parked in front of my house. And it got me all nostalgic for the unusual car-ride home from our own wedding late one Thursday night 22 years ago. Josh and I were the first of our friends to get married. 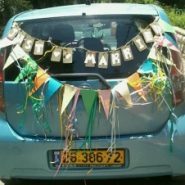 So, when I had to figure out how to plan my own wedding, I had only attended 2 religious weddings in my life, neither in Israel. That meant I was quite clueless. And considering that, I did quite a good job. I’d found a good guy to marry. I’d found a white dress. I’d found invitations, which I sent out in time. So, in the middle of the first round of dancing, I leaned over to our friend, Lisa, and asked her if after the wedding, she might be able to give us a lift. Lisa had to hold her stomach, she laughed so hard. What an unforgettable ride home from the wedding! Josh and I and another guest squished into the back seat of Lisa’s little, 4th-hand car, somewhat similar to the “Just Married” car parked outside my house right now. Maybe that’s why I still get excited every time I see one of those decorated wedding cars, like the one parked outside my home right now. I remember the magical song-filled ride home from our wedding, in that crowded, 4th-hand car. In our marriage, in every Jewish marriage to this day, an ancient prophecy come true. pleeeeeaaaase tell!!! OMG I can’t begin to imagine how many more untold stories you have. I hope you’re working on a memoir. You have so much material already; you’re almost there. When we got married, neither of us drove yet. We got a ride home from friends of ours, a young couple that were married a few months. On the way home after the wedding the husband pulled the car over to the side on a busy highway to let his wife open her car door and throw up outside the car! We were vaguely horrified and then we were told that they just found out she was expecting and they didn’t even tell their parents yet. They asked us for our discretion in not telling anyone which of course we didn’t…not until many months later.